I have followed and loved Dixie for years now so I was super excited to be paired up with her to create a tutorial for her blog as part of Sewing Indie Month. 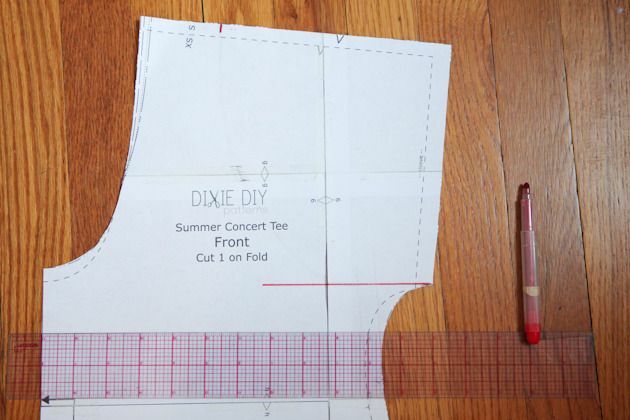 I already loved the Summer Concert Tee by Dixie. 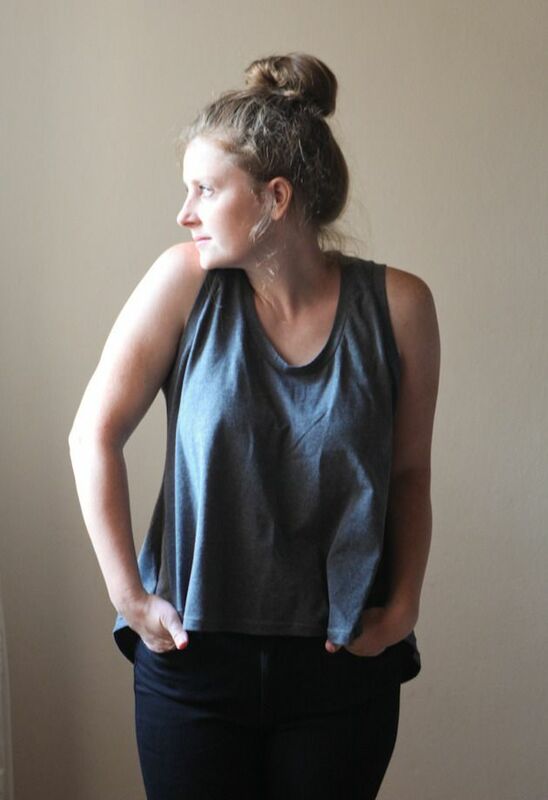 I made it up a couple of years ago in some hand dyed shibori fabric and that top is still in regular rotation in my wardrobe. I’ve always wanted to make a tank top version of this swingy top, so I figured this was the perfect occasion. 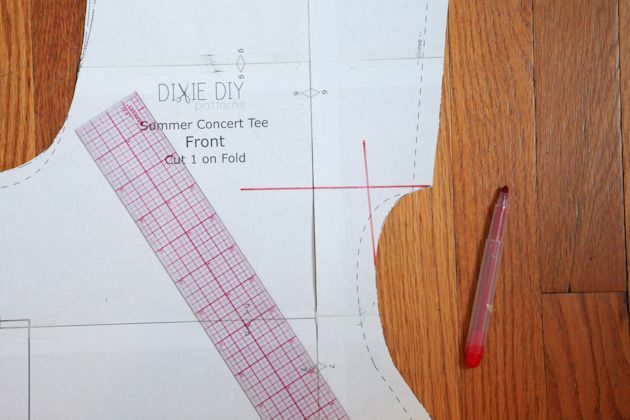 To start off you just need to assemble your pattern pieces and cut them out as usual. You will not, however, need the cuff piece. Starting on the front pattern piece, mark the width that you want for the shoulder of your tank. I decided on 2 inches, knowing that I could make it thinner later on. 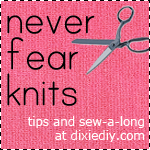 You will also need to add 1/4″ seam allowance to each side. So I made a mark 2 1/2″ total from the neckline. Now move down to the underarm and draw a line out from the armpit that is perpindicular to center front for about 5 inches. Draw another line up from the flat part of the side seam (right before it curves back out for the sleeve) and continue that line up for about 5 inches. The place where the two lines connect will be the new top of your side seam. Either by freehanding it like I did, or by comparing it to a tank from your wardrobe, curve the underarm point to meet your new shoulder point. Repeat these steps for the back pattern piece. Here is what your two pattern pieces should look like. Don’t worry too much about it being perfect. Knits are super forgiving. 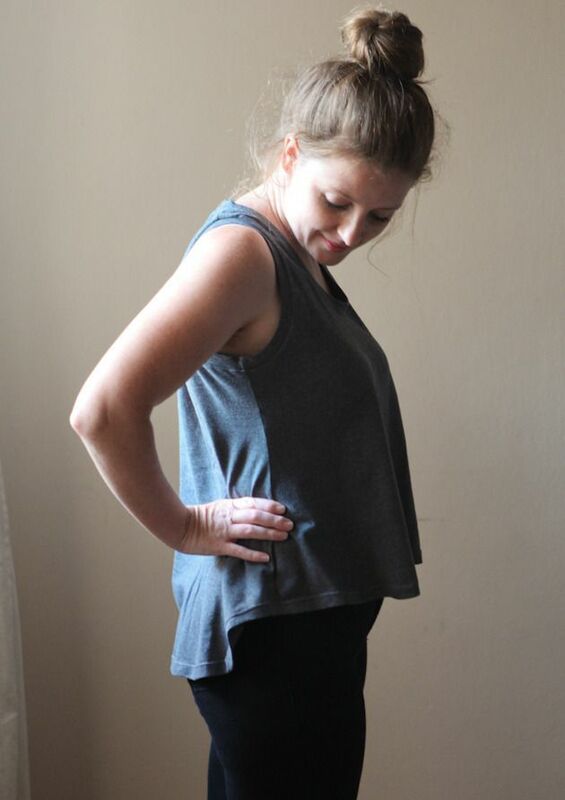 Sew up your shoulder seams and side seams and try it on. You may choose to thin out the straps or take a bit more out of the side seam at the armpit. Make those changes now. Finish your neckline and hem according to the instructions. You are going to finish the armholes in the same manner as the neckline. 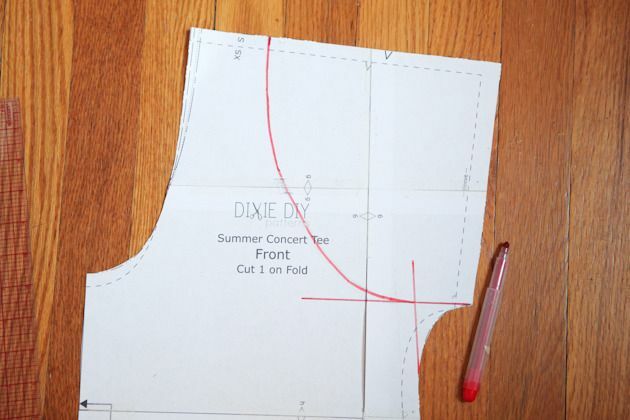 Measure your front and back armholes and subtract 2-3″ from the length for your binding. 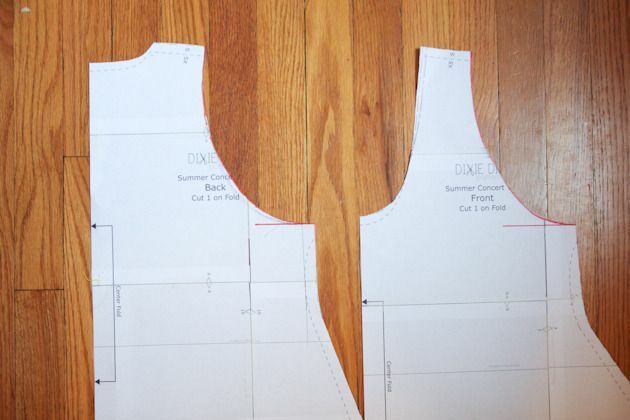 Cut out two pieces of binding that are the same width as the neckhole binding but the length that you just calculated. Sew them to your armholes. That’s it! 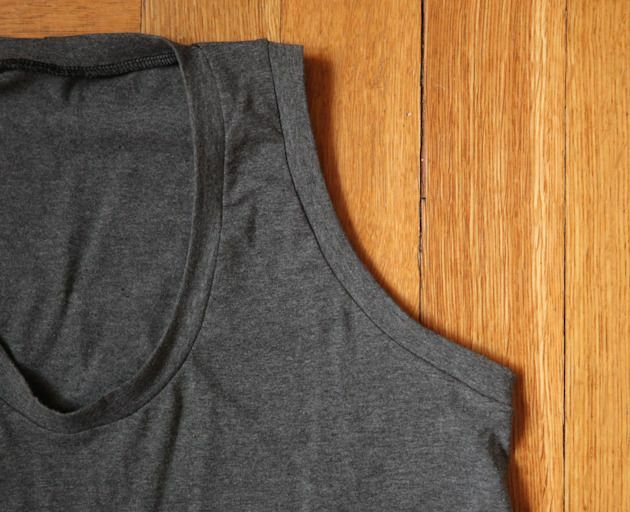 A fun, swingy tank that is ready for a summer concert or day at the park. Thanks so much Dixie for having me! Big thanks to Kelli from True Bias for this tutorial! I love how Kelli seems to be able to take the simplest garment and make it look effortlessly chic. I’m always inspired by her personal style. Follow along with Sewing Indie Month 2015 and check out more tutorials like this neat button loop hack of the True Bias Southport Dress from Lisa of Paprika Patterns. Well, Sewing Indie Month is finally here and I have the pleasure of having the first post of the month! Today I’m sharing my interview with designer Sylvie Privat of Soma Patterns. Sylvie has created a line of “zero-waste” patterns – eco-friendly designs that leave no scraps! It’s a design idea I had never seen offered by any other company. She has also started releasing updated versions of vintage 50s and 60s patterns after her mother gave her some old French sewing magazines. First of all, what’s your background in sewing? How did you learn to sew? Why did you want to pursue it as a career? I have been sewing since I was about 10 years old, creating my own patterns by 15. My mother and my grandmother taught me how to sew, and self taught myself before I took formal classes and graduated from Canada College and Apparel-Arts in San Francisco. I pursued that career among others because I just love to make pattern and sew. Your work has brought you from France to California. What made you decide to settle in San Francisco and how has the city inspired you? I moved to San Francisco from France to take a business course (now I know what I do not like in the business field) and I met a guy who became my husband… I am still in SF almost many years later. My day of work is very variable and I do not have a typical day! I love that, too. What’s your process for designing zero-waste patterns? Is it difficult grading a zero-waste design to smaller or larger sizes? Creating zero-waste pattern is not that easy. The first pattern I made was the Abby jacket and I created it mostly from pattern drafting, and multiple muslin. The tops and skirts have been created with a draping approach. The Dorianne dress was truly a combination of both. The grading was more tricky. I really wanted to have several sizes so the tops were graded at the same time than drafted, to be sure the different sizes could work. 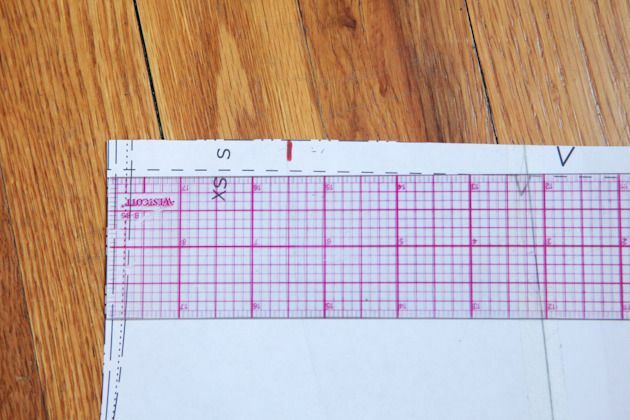 What are some ways home sewists can creatively use their fabric to produce less waste? There are many ways to use scraps of fabric, but if the home sewists are like me, I have too many boxes of scraps and no time to get through them to really use them all. I embrace the idea of not generating scraps from the start. Plus I like the puzzle challenge the zero-waste provide. You’ve been focusing on vintage patterns lately – had you sewn much vintage before? I have sewn few vintage garments before getting really into it. Vintage garments are always interesting – whether it is the design detail or the pattern and construction. How have you adapted the vintage styles to fit modern figures and updated the instructions to make it easier for sewists? The adaptations depend on the garment. On the blouse 1954, I had to change the darts position and add on the length to make it more like today’s fit. I added also a back facing. Today the edges are not finished the same way, with hand slip stitches at the collar. On the 1962 coat, I made it for a jacket or a coat and added pockets and lining. Some other patterns I am working on right now, will need more adaption, like the length of the torso or transforming the front so it can have a front closure. I also try to simplify the construction. Some vintage patterns require a lot of hand sewing which is not always welcome in today’s patterns. What new vintage designs are working on right now and when will they be released? The Coat-Jacket April 1962 is a brand new pattern, and is release for the first time as part of Bundle #2, and on my site mid-September. I am working on a dress which go with the coat and this pattern should be release by the end of the year. I have a couple of dress patterns which will be offered as a dress and a tunic/top. Thanks so much to Sylvie for talking with me. You can purchase Soma Patterns’ brand new 1962 coat pattern in the Sewing Indie Month Bundle #2 from now until September 10th. This bundle features patterns from 10 designers! It’s pay what you want but the more you pay the more patterns you’ll receive. And 20% of bundle proceeds will be donated to Women for Women, an organization which helps women dealing with violence, marginalization, and poverty due to war and conflict. As for the rest of Sewing Indie Month, stay tuned for more interviews and some great tutorials from some of your favorite pattern designers and hopefully some new companies you haven’t heard about before!